A Los Angeles startup a year in the making has finally launched a product that night club owners and other nightlife venues will get a lot out of. 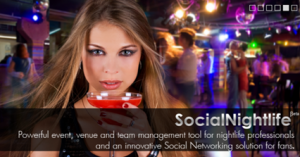 SocialNightlife is a complete platform designed to help nightclubs and other establishments keep track of their VIP’s and loyal customers. Nightlife professionals will now have the ability to digitally check-in guest-list and VIP customers and track activity by team member, venue, event and client. Venues will also be able to setup custom promotions and reward their loyal guests as a result of the social media features built as a front-end to the professional business tool. They already have a handful of popular night clubs on board like the famous Marquee nightclub in Las Vegas. Using the SocialNightlife platform VIPs, loyal customers and social media rockstars will be able to get into clubs quicker and their information will be utilized more efficiently providing a service to both the patron and the establishment. The company has already partnered with strategic advisors and stakeholders in clubs in Los Angeles, Las Vegas and Miami. You’ll find an amazing night life experience at the biggest startup conference in the U.S. everywhereelse.co The Startup Conference, limited tickets still available.